An upcoming auction at Sotheby’s in New York is featuring a number of amazing watches. The event is set to take place on June 11, 2015 and is titled “Important Watches.” Sotheby’s will feature a variety of high quality timepieces including a fine and rare collection of Swiss Mechanical Marvels. Vintage timepieces, including Rolex and Patek Philippe, will also be highlighted. Lot 133 is the highest priced Rolex piece at the auction. 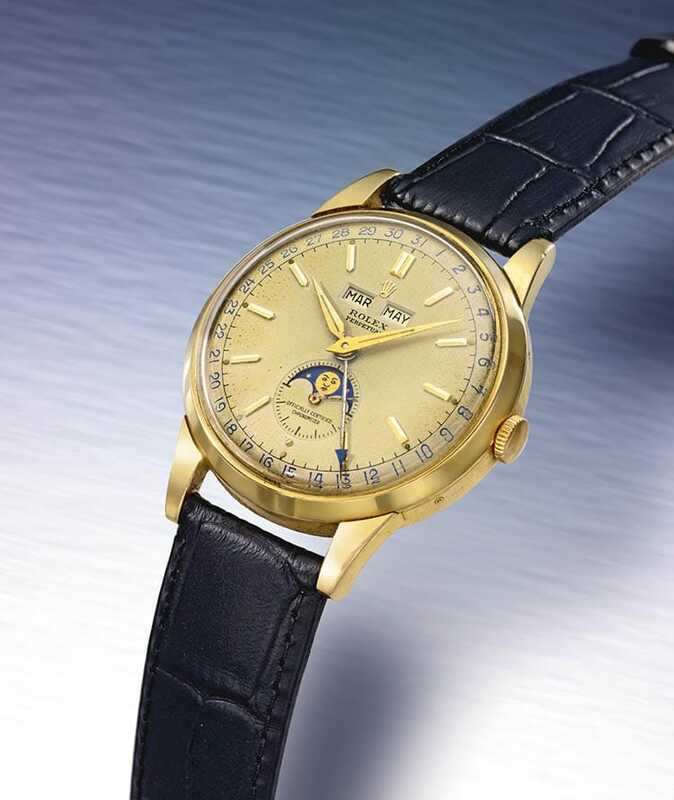 A fine yellow gold ref 8171, this timepiece features a unique automatic triple calendar with moon phases. Made around 1950, this truly vintage watch is both aesthetically pleasing and extremely functional. The unique apertures are controlled by a 10.5″ automatic nickel-finished lever movement with 18 jewels. The triple calendar features the day, month and moon-phases. The round 18k gold case and leather band complete the vintage look. 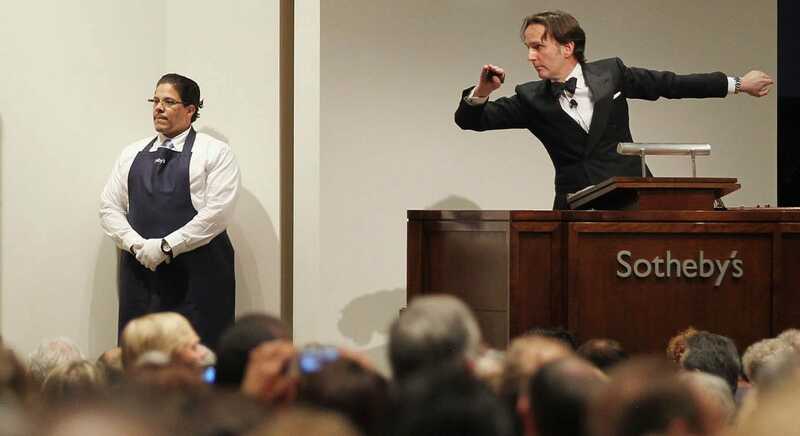 This special piece is estimated to sell for $25,000 to $35,000. Lot 132 is a spectacular Rolex Day-Date Reference 18038 in yellow gold. Featuring a caliber 3055 automatic nickel lever movement with 27 jewels and mono-metallic balance, this timepiece is precise. It is also visually appealing with an 18k yellow gold brushed and polished Oyster case, gold fluted bezel and champagne dial. Even the applied baton indexes are gold, giving this watch a rich and luxurious air. Complete with box, papers, leather notebook, original tag and even the factory sticker on the case back, this great timepiece is estimated to fetch between $12,000 and $18,000. One of the most unique Rolex pieces at the auction is a Lady’s White Gold and Diamond Set Bracelet Watch from around 1970. This tiny timepiece utilizes a caliber 1402 manual winding jeweled movement. The 18k gold white case features a matching bezel that is studded with round diamonds. The bracelet continues this theme, giving the watch a rich look. Estimated to sell for $5500 to $6500, this stunning watch would look beautiful on any lady’s wrist. Rolex is well represented at the latest Sotheby’s Important Watches auction. 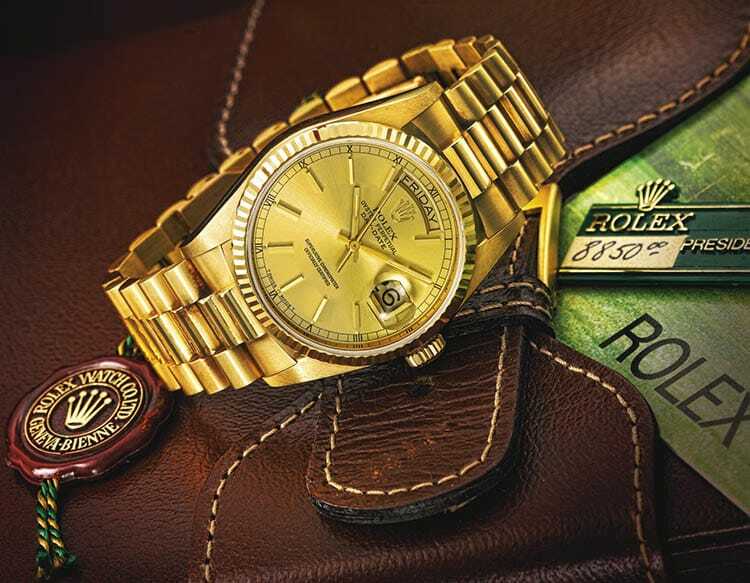 In the past, many Rolex timepieces have sold for far more than estimated, some even setting world records. Hopefully that trend will continue this time.